Hey champ! 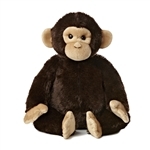 Need a chimp stuffed animal? Well then, how about putting down that banana and having a look at these awesome stuffed chimps and plush chimps? The right chimpanzee stuffed animal can be the difference between having a good day and having a great day. Let's say you are walking down the street and a rare bird lands right in front of you. That's a good day, but you're walking alone and you have no one to share your awesome story with. Wait, what's that in your pocket? Oh, it's a stuffed chimpanzee. You pull out your plush chimp and excitedly tell it all about the rare bird you just saw. Little do you know, a producer from Animal Planet is walking behind you. Upon hearing your passion and knowledge about the rare bird and seeing your excellent taste in stuffed chimpanzees, she immediately offers you your very own nature show. That's a great day. Do yourself a favor and don't get caught without a chimpanzee stuffed animal. Scroll down to have a look at all of our great stuffed chimps and plush chimps and click their photos to learn more about each one. Oh, and enjoy that banana!